How to Deal with Huge iPhone WeChat Video Call Data Usage? How to Deal with Huge WeChat Video Call Data Usage on iPhone? Do you have huge WeChat size on your iPhone? This is a possibility because WeChat is a great app which boast of very interesting features like video calling, texting, voice calling etc. These features are what every day users of iPhone would normally engage it and as a result the possibility of having huge WeChat size becomes higher. To be clear, WeChat video call is capable of eating up a whole lot of data storage on your device because it is high data consuming program. Unfortunately, huge WeChat video call data usage is capable of affecting your device by creating some performance related issues like slowing down your device. For this reason, it is necessary to clear up WeChat data on your iPhone device. Clear Up Hidden Useless Junks and Temporary Files: Your WeChat produces a lot of useless caches, junks and temporary files that eat up storage space. Unfortunately, these files are invisible but the good thing is that iMyFone is capable of clearing them up. Erase WeChat Photos and Videos: The reality is that WeChat photos and videos get stored on your iPhone at the end of the day and this is responsible for eating up the most space on your device. iMyFone WeChat Eraser for iPhone is capable of erasing them in such a way that they cannot be recovered again. 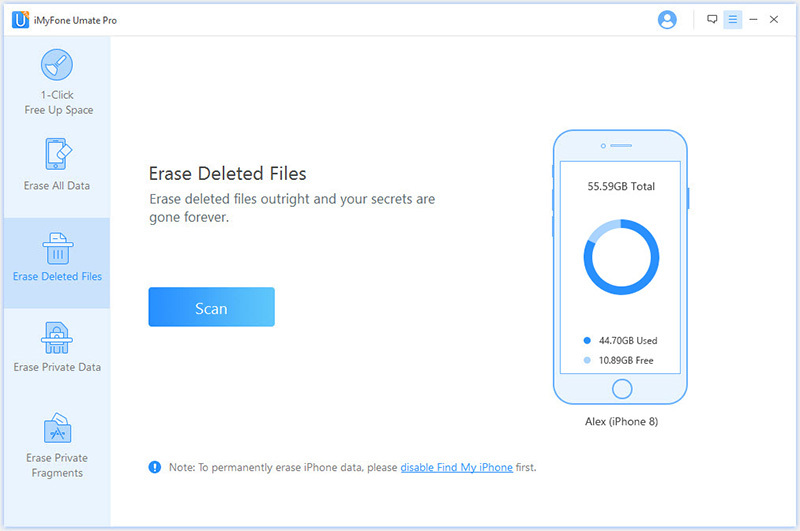 Erase Previously Deleted WeChat Files: If you have previously deleted WeChat files via the app or any other simple means initially, the truth is that they also can be recovered with modern recovery tools. However, the program is capable of seeing these already deleted files and erase them again, and this time it cannot be recovered again even with the best recovery tools and this protects your privacy. Selectively Erase WeChat Messages: The good thing about the iMyFone Eraser is that you can selectively erase WeChat messages if you have huge number of messages on your WeChat. The implication is that you have the opportunity to safeguard other WeChat messages on your device instead of rendering the whole process unsuitable. What are The Steps Involved in Erasing WeChat Data on iPhone? Step 1: Run the program and connect your iPhone to it. 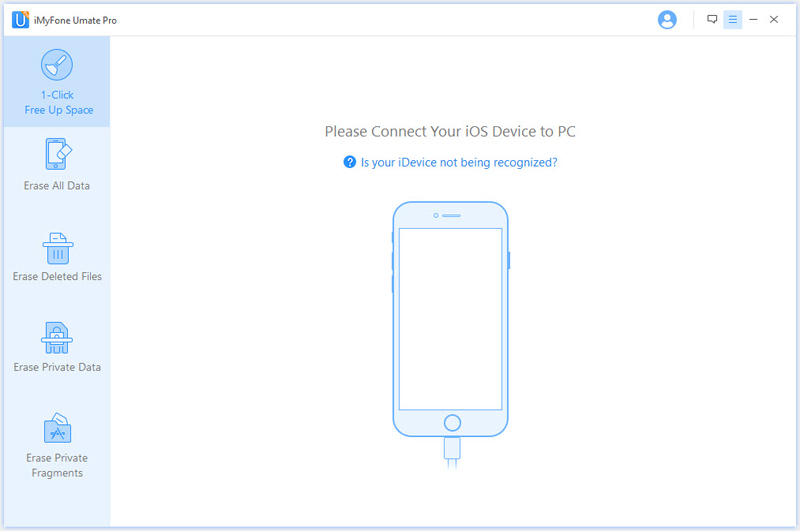 Step 2: Select the capable erase mode and scan your device. Step 3: After scanning your device, tap clean/erase to erase WeChat data on your iPhone/iPad. 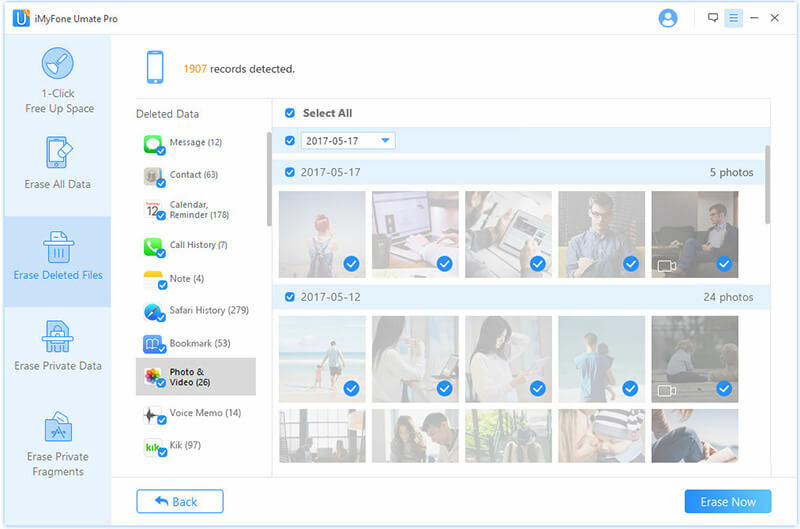 It is important to note that the Umate Pro has a superb “1-Click Cleanup” feature which can be used to free up iPhone storage easily. It offers you the capability of removing junk and temporary files, exporting/removing large files, exporting/compressing/deleting photos and other operations. It helps restore your iDevice in such a way that makes it to start performing at optimal speed once again.